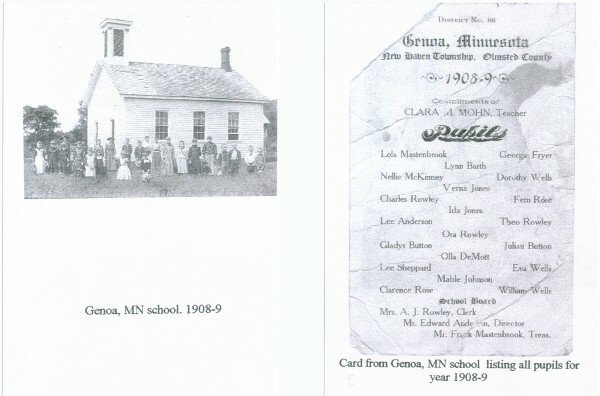 Shown is a photocopy of a card from Nellie McKenney’s school 1908-1909, in Genoa, Minnesota, New Haven Township, Olmsted County, District No. 86, with an image of the pupils and a listing of their names. Clara M. Mohn was the teacher. Pupils were Lola Mastenbrook, George Fryer, Lynn Barth, Nellie McKinney, Dorothy Wells, Verna Jones, Charles Rowley, Fern Rose, Ida Jones, Lee Anderson, Theo Rowley, Ora Rowley, Gladys Button, Julian Button, Olla DeMott, Lee Sheppard, Eva Wells, Mable Johnson, Claren Rose, William Wells. Mrs. A. J. Rowley was the clerk of the school board, Mr. Edward Anderson the director, and Mr. Frank Mastenbrook the treasurer. Nellie Adelaide McKenney was born December 24, 1902 in Pine County, MN, and died January 24, 1954 in San Francisco, CA. She was a daughter of George Ellis (Bob) McKenney (1877 – 1937) and Rachel Adeline Arnold.